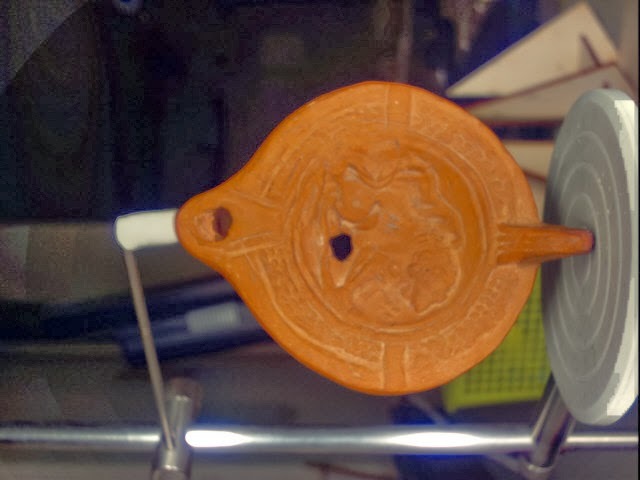 Roman lamp color final from terra-arte on Sketchfab. This is a 3D scan of a replica Roman oil lamp, done with the NextEngine scanner at FabLab Groningen. You can do a scan yourself, so come to visit the FabLab. FabLab is open every day for the public from 9:00 to 13:00. For only € 10,00 you are able to use machinery like 3D scanner, 3D printer and lasercutter, and get assisted by professional (all volunteers/ enthousiasts) personell. For some machines and materials you have to pay extra, but hey, big deal!